"I'm very pleased that Hall of Fame voters recognized Mike's consistently dominant career by honoring him with enshrinement into Cooperstown. While he went about his business in an understated way, Mike was a premier pitcher for almost two decades while competing in the grueling American League East. I'd like to congratulate Mike on this incredible distinction and for his many years of contributions to the Yankees and the game of baseball." "I'm so happy to see Moose recognized for his incredible career. Accomplishing what he did while spending all 18 of his seasons in the ultra-competitive AL East is remarkable. Unlike the big arms that dominate today's pitching landscape, Mike was a quintessential craftsman who played up to his strengths and hunted for the weaknesses in his opposition - before that level of preparation was a commonplace thing to do. More importantly though, he was a gamer, plain and simple. He wanted the ball, and did everything within his power to get himself ready to contribute. I don't get too invested in players' individual milestones, but I was thrilled that he won 20 games in his final season. He deserved that validation then just like he deserves the validation he's going to get this summer in Cooperstown." 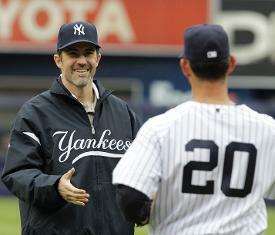 "I absolutely loved playing behind Mike Mussina. He was a perfectionist and his athleticism allowed him to do whatever he needed to do on the mound to be successful." "Moose was the most intelligent pitcher I ever caught. He made catching fun because he was so well prepared. When we took the field together, he was always two steps ahead of everyone else wearing a uniform. This special recognition is well deserved. Congrats Moose." "Congrats Moose. This is such a deserving honor. What you were able to accomplish while spending your entire career in the AL East was absolutely amazing. You were one of the best pitchers I've ever played with, and I was always in awe of the way you attacked hitters - exploiting their weaknesses with control and precision of such an array of pitches. You were a true master of your craft." "Mike was a very quiet and very smart pitcher; he was definitely one of the best of his generation! He just never made the headlines because of his quiet personality!" "When you were catching Mike Mussina, you quickly realized that you were catching a pitching genius! I have never caught a pitcher who was more self-aware of what kind of stuff he had in each particular start. One day he would be a dominant power pitcher with his fastball, and five days later he would be a finesse pitcher with his off-speed stuff. To do it all in the offensive AL East - genius!" "To broadcast a game pitched by Mike Mussina was to smile every fifth day and learn how much the mental aspect of the game counts. In the first inning, I'd watch him figure out what he was going to use that day, and then see him execute it … perfectly, more times than not. He has been underrated and underappreciated, but not by anyone who watched him spend his entire career in the AL East, go against those AL East lineups for years, and pitch in those AL East ballparks. Congratulations, Moose! (And please try to smile!)"